The third part of the most famous film trilogies always seem to be the ones most laden with disappointment, for one reason or another. However, Peter Jackson seems unlikely to let his magnificent Lord of the Rings adaptation go out in anything but bravura fashion. I think it would be fair to say that with regards to the music, Shore has settled into his role of scoring an epic and Return of the King manages to revisit some of the humanity of The Fellowship of the Ring, notable after the alternately dourly bombastic and insular moments of The Two Towers. Unlike the durm and strang openings of the first two, A Storm is Coming has a much more solid and considered dramatic base, although the lightness in the second half is somewhat unexpected. The lack of choir through much of the score is most notable. While it's a nice extra dimension to any piece of music and, at a prodigious volume, an imposing aural spectacle it can grate after a while. Thus, for Return of the King, the occasional choral passages feel 'earned' and a much more effective. The amount of action without chorus is significant, most notably the stirring The White Tree which isn't a million miles away from the more frenetic moments of Starship Troopers (of all things). It's certainly a rare occasion when Shore takes a precedent in anything other than classical, most notably his Sibelian theme for the Fellowship which only makes a few fleet appearances, but unlike its insistence in the first score, the appearances here are a refreshing return to a familiar melody. The major new theme is for Gondor and is surprisingly upbeat, with a sprightly fifth opening (as with many of Williams' most famous tunes) and fairly unadorned major key harmonies, it has an easy simplicity that is something of a surprise after the angst that surrounds many of the themes. Most of the other melodies appear, if briefly, but the most sustained selection is in the titular track toward the finale that puts in a notable reprise of the charming Shire and Hobbit melody, plus many other melodies from the whole series. I must admit that the themes for the first film still remain the most memorable, notably his creepy Sauron melody which is given one of its most extended outings in Minas Morgul, but perhaps the familiarity and inter-melody connection will become more apparent as the trilogy as a whole can be judged. 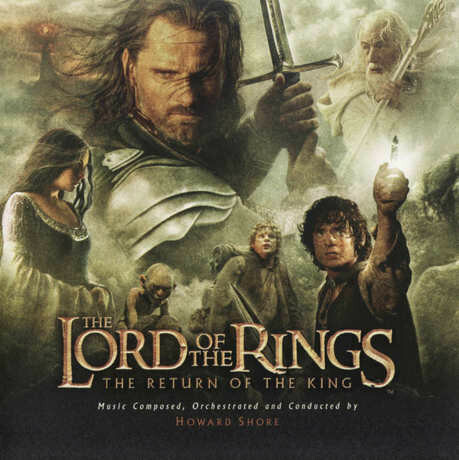 Cast members Billy Boyd and Viggo Mortensen contribute briefly, the former intoning a short, downbeat, slightly folk like tune, at the end of Steward of Gondor and the latter a short incantation during the lengthy Return of the King cue. Sir James Galway and his flute contribute briefly, although I don't suppose anyone would have noticed whether it was him playing or not. More powerful a presence is that of opera singer Renée Fleming, whose contributions are beautiful and have a great presence, notably during The End of All Things. The most notable vocal contribute is from Annie Lennox who performs the end credit song, Into the West. Her voice seems just a bit too raw and loud for the rather intimate style, although the song itself is pleasant enough, but likely to inflame those hoping for a nice end credit suite. In truth, Enya's finale to the first film seems ideal, but in any case, Shore's final few score cues are a fitting and dignified. There is no ungainly celebration music here, just a solid close to the 21st century's first great epic film series. I think it will take a few years for fans to fully grasp the entire scope of Shore's music. As to whether his three Lord of the Rings scores deserve a complete release, I am somewhat skeptical. They have the melodic content and, don't get me wrong, are superb music, but I don't think hearing all nine hours (or whatever) would be beneficial. I'm not convinced they have the narrative structure of the best epic scores (and, naturally, I include the original Star Wars trilogy in that, which is perhaps the most obvious, if not the best benchmark), but the content is still varied and inspired enough to certainly warrant some expansion of the original albums. Return of the King is a superb finale and, as an indication, I literally listened to it over and over when I first got it, something that I wasn't inspired to do with The Two Towers and even The Fellowship of the Ring took some time to get into. Here, however, Shore grabs the listener from the outset and the ride to the finish line is perhaps the best of all.